The Black-Scholes model can be used to estimate implied volatility. Implied Volatility can be estimated using spot price, strike price, asset price, risk-free rate, time to maturity, and dividend yield. To achieve this, given an actual option value, you have to iterate to find the volatility solution. 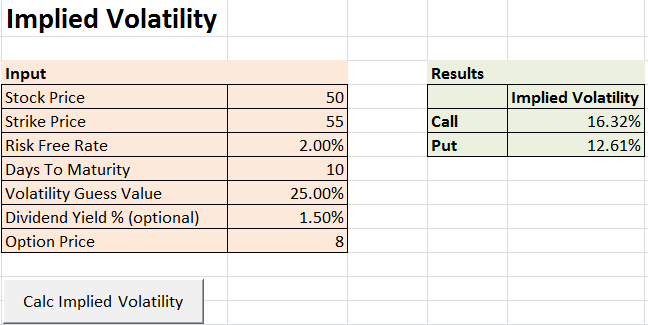 There are various techniques available; however we will use the Newton-Raphson bisection method for Implied Volatility Calculator. Once Black-Scholes is structured, we use an iterative technique to solve for σ. This method works for options where Black-Scholes model has a closed form solution. An ITM option has 10 days for expiration. The strike price is 55 and the current stock price is 50. The stock has daily volatility of 0.03. The risk free interest rate is assumed to be 0.02. The spreadsheet is quite straightforward. Just enter current stock price, strike price, risk free rate, days to maturity, dividend yield (if any) and the option price. The VBA computes implied volatility and back solves the option price which you have entered. As a verification, the option price calculated using Black-Scholes equation must equal to the option price specified in the input parameters. 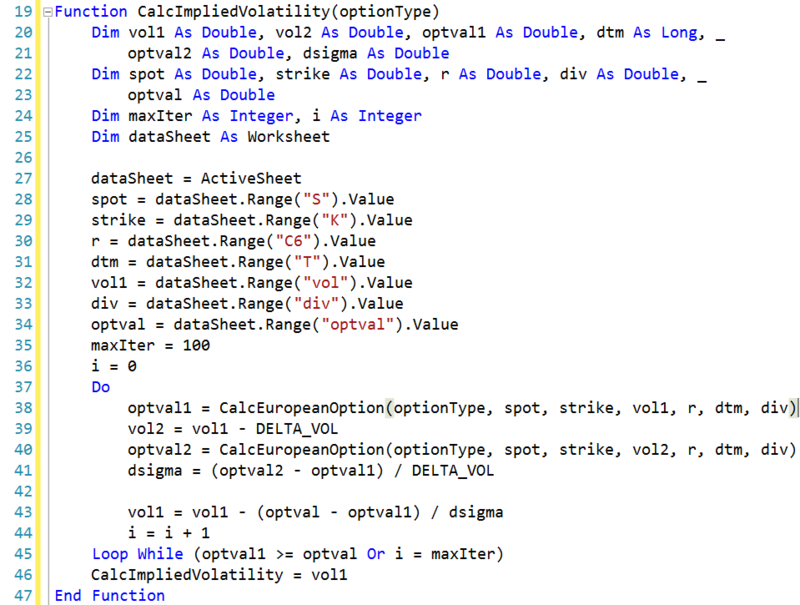 The following VBA function calculates the price of an European option using Black-Scholes equation. Going by the function, lines 19 through 47 calculate implied volatility for given input parameters as defined in name range on worksheet. The method iterates till it finds a solution. Precision is defined by constant DELTA_VOL, which is the acceptable error of the function’s result. Since the function iterates to find the correct volatility, setting a higher value can speed execution in a worksheet containing 100 and above instances of this function. Lower values increases the precision. Example: If the exact implied volatility is 16%, setting “Precision” to .05 will cause the function to return a value between 15.95% and 16.05%. “European” call options have the same theoretical value as “American” calls. American puts are difficult to value than European puts, but experts agree the Black-Scholes formula provides a good approximation of volatility. Since the Black-Scholes formula cannot be deconstructed to solve for volatility mathematically, this function uses an iterative process to find the implied volatility. It is very similar to Excel’s “Goal-Seek” function, and other built-in Excel functions such as IRR. Dividend Yield – The annualized dividend yield of the underlying stock expressed in continuous compounding terms. I feel that the host of this web-site is a dedicated person who have passion to develop & to share. Thank you for your kindness in sharing your work. Unfortnately, the VBA code is password protected and no password seems available?